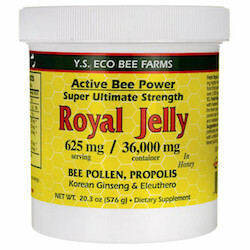 This Royal Jelly living food combination is one of the favorites of many of our clients who have been ordering it in cases for years! Bee pollen is a highly bioactive source of naturally ocurring multi-vitamins, minerals, carotenoids, bioflavanoids, phytosterols, amino acids, fatty acids, enzymes and more. Our Raw Honey is 100% pure, natural, unpasteurized and unfiltered, fresh from only beehives that are well. This true Raw Honey provides the highest levels of antioxidants, live enzymes, minerals and vitamins as a functional whole food. Suggested Use: 1 or 2 tsp. twice a day between meals on an empty stomach followed by a small amount of water. For best results, take regularly on an empty stomach. Never mix with anything hot.